Wafa Ghnaim will be presenting designs from her self-published digital book, Tatreez & Tea: Embroidery and Storytelling in the Palestinian Diaspora, which attempts to preserve the craft of embroidery as well as the art of storytelling that is encapsulated in each traditional Palestinian motif. Palestinian tatreez embroidery is a centuries-old folk art, traditionally passed from mother to daughter over a cup of tea. Wafa and her sisters grew up learning the time-honored tradition of embroidery from their mother, Feryal Abbasi-Ghnaim. Researching over thirty years worth of oral history interviews, recorded demonstrations, lectures, journal entries and photographs from her and her mother, Wafa documents, decodes and preserves the patterns, meanings and oral history of over a dozen traditional Palestinian embroidery designs passed on for generations between women in her family. 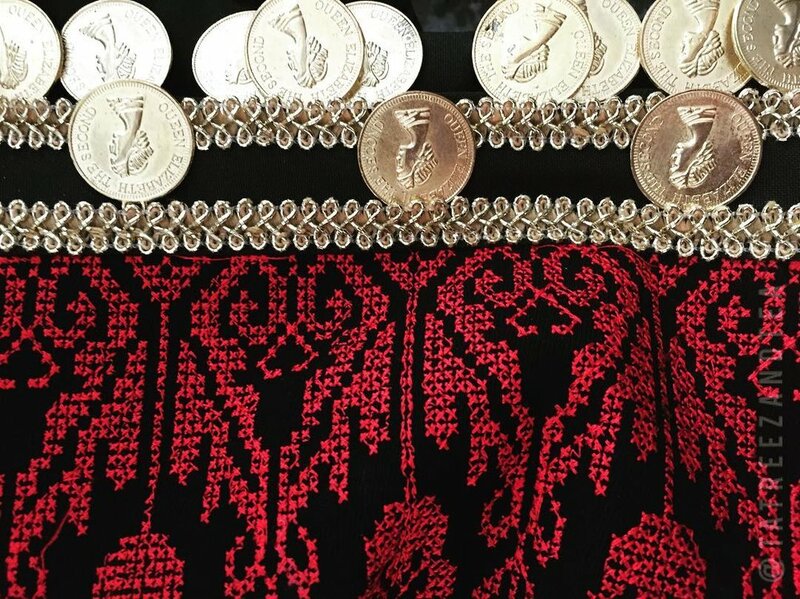 After releasing the book in 2016, Wafa founded her nonprofit venture Tatreez & Tea, to provide additional educational resources, workshops, lectures and publications, to preserve Palestinian embroidery, folk arts and storytelling traditions in the diaspora. To learn more about the book project and organization, please visit http://www.tatreezandtea.com. Wafa Ghnaim is an American born Palestinian businesswoman, writer and artist. She and her two sisters began learning Palestinian embroidery from their mother at 4 years old. Throughout her life, Wafa has traveled alongside her mother for various exhibitions, lectures and folklore festivals from Massachusetts to Oregon. Wafa was awarded a two-year apprenticeship opportunity through the Oregon Folklife Network and the University of Oregon in 1993 through 1995 with her older sister, Fida, which enabled them to assist their mother in the completion of a Palestinian dress titled “The Gardens.” “The Gardens” was displayed in the Oregon State Capitol as “the dress of a million stitches”.